Bathwick St. Mary Church School is part of the parish of Bathwick. Bathwick St. Mary’s Church has always played a key role in the life of the school. The school has been in the Parish of St. Mary’s since Victorian times, initially when it was located on St. John’s Road, and from 1986 when it moved to its current site on Darlington Road. Local Bath residents will be familiar with the sight of Bathwick children in their uniforms walking to church for their end of term services. All Bathwick pupils will have fond memories of the church, whether it is singing in the choir at the Leavers’ Service or playing a variety of instruments in the ensemble during the Christmas or Easter services. The Rector, Father Peter, plays a vital part in bringing the church and the school together – and is a well-respected figurehead for the children, taking part in many school celebrations and events on a regular basis including Collective Worship and a termly Eucharist. 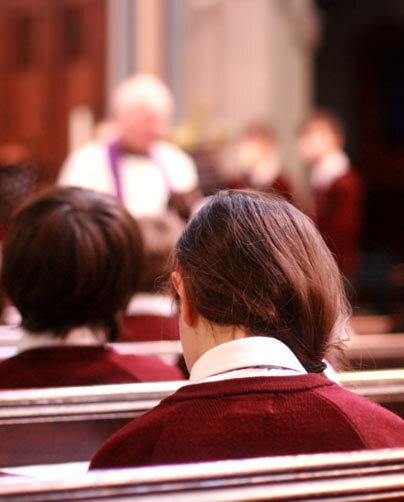 The church, which financially supports the school, is also responsible for appointing eight Foundation Governors, and the Rector is an ex officio Foundation Governor. Several members of St. Mary’s congregation are also actively involved in the school. Find out more about the United Benefice of Bathwick.